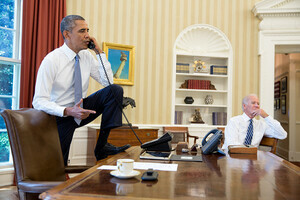 President Obama in the Oval Office with Vice president Joe Biden on Saturday. After a 45-minute walk Friday night, President Barack Obama made a fateful decision that none of his top national security advisers saw coming: To seek congressional authorisation before taking military action in Syria. The stunning about-face after a week of U.S. saber rattling risked not only igniting a protracted congressional fight, which could end with a vote against strikes, but a backlash from allies in the Middle East who had warned the White House that inaction would embolden not only Syrian President Bashar al-Assad but his closest allies, Iran and Hezbollah. Posted in Misc and tagged Obama, Syria at 12:37 pm on September 2, 2013 by Broadsheet.